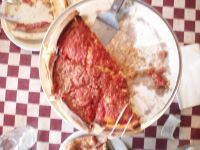 Chicago is known for its deep dish pizza—perhaps a lesser known but just as incredible pizza, is stuffed pizza, Chicago’s deep dish variation. I ate one of Chicago’s best stuffed pizzas yesterday. I had Stefano’s stuffed special. The layer of cheese was as thick and gooey as expected. Each bite consisted of mouthwatering part-mozzarella, part-parmesan cheese and fresh toppings. The green pepper and onions were delectably crisp and the sausage was aromatically tasty. The sauce was a little thicker than expected with chunks of tomato—it didn’t personally bother me, but I can understand if someone wasn’t a fan of that. The price and timing were great too. Unlike certain deep dish places that take at least an hour or later to cook you a pizza (ahem, Gino’s East), this pizza was brought out in 45 minutes. For a medium stuffed pizza, it cost right around $20, and there were plenty of leftovers for the next day. This Chicago stuffed pizza gem is located in charming Lincoln Square on 2124 Lawrence Avenue. Parking is found right around the corner on the north end of Lawrence.